Location: Usually in deeper zones of lake, to depths of 30 feet. 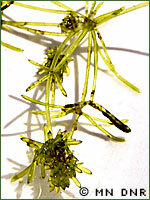 Description: An advanced form of algae. It may grow several feet long and resemble larger plants; light-green to bright-green in color; stemlike branches with whorls of leaves; grows entirely below the water surface. Hints to identify: Resembles muskgrass but does NOT emit a strong musky odor when crushed; translucent stems and leaves appear to be filled with green "jello". Importance of plant: Provides food for waterfowl and cover for fish; also supports insects and other small aquatic animals, which are important foods for trout, bluegills, small mouth bass, and largemouth bass. Management strategy: See DNR regulations. It's best to leave these plants alone. Stoneworts typically grow in deep water where they do not interfere with boating or swimming.